IPE requires periodic application of a wood finish every so often. Much more so than a normal wood such as Cedar or Pine. When reapplying a stain or finish to IPE you will need to prep the wood first by removing dirt, grime, mold, etc. Failure to prep the IPE properly will result in a poor appearance of the stain and or premature coating fading. 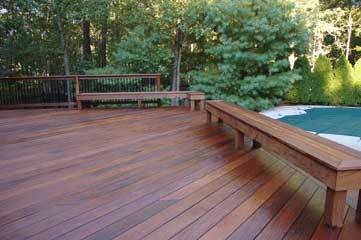 What is the Best IPE Deck Stain? Very good question as there are not many deck stains or sealers that work well for IPE or other exotic hardwoods. IPE is a Brazilian hardwood that is very difficult to penetrate. Many wood and deck stain will not properly penetrate into this wood type. This results in premature fading of the finish. In this article, we will look at what makes a great and long lasting IPE finish. IPE is an extremely beautiful wood when stained and will be the envy of your neighbors. The problem with exotic hardwood decking such as IPE is that it will require maintenance annually. It is best to choose a pigmented wood stain that will enhance the reddish brown tones of the IPE as if wet with water. This will filter the UV and prolong the graying. Stains that are designed to penetrate IPE will work better and will be easier to clean and reapply when needed.